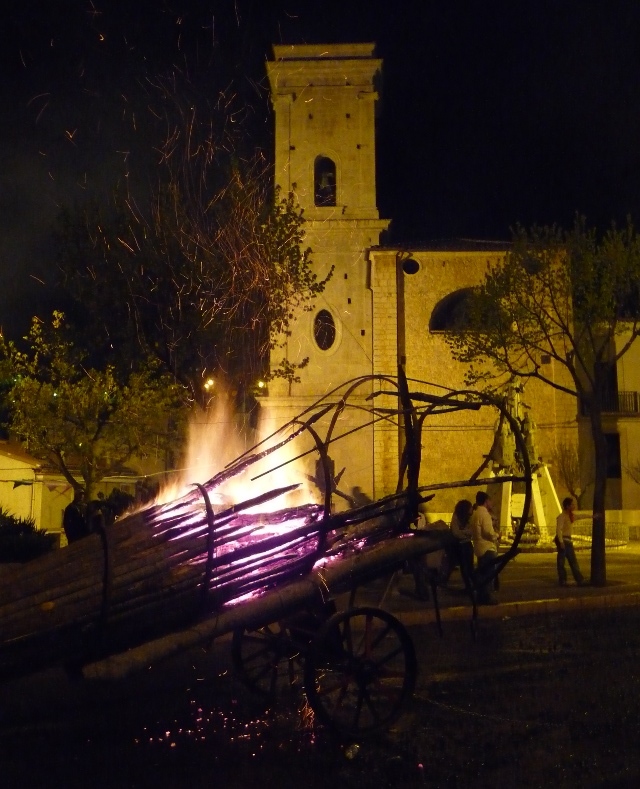 San Marco in Lamis, a small town in the hills of Puglia’s Gargano peninsula, is the home of one of Italy’s longstanding Easter traditions. 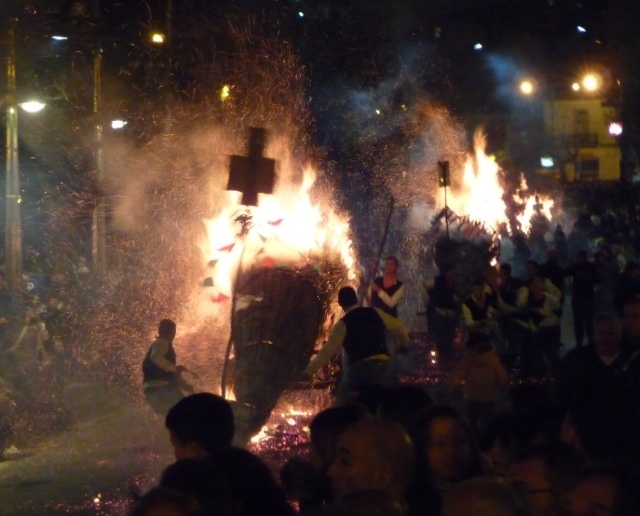 There are three parades through the town on Good Friday – one in the early morning (5.30am – I’m ashamed to admit, we couldn’t be bothered to get out of bed for it…), one in the afternoon, and one in the evening. For San Marco, there’s no penitents, anonymous beneath pointy hoods. The afternoon procession leaves the church of San Antonio Abate, in the busy but narrow thoroughfare of the Corso Giacomo Matteotti. A crowd has gathered expectantly for the parade, amongst them the dozens of Boy Scouts and Girl Guides who are to take part. Eventually, the doors of the church open, and a group of men, immaculate in dark suits and sunglasses, carrying crisply folded white cloths, head in. 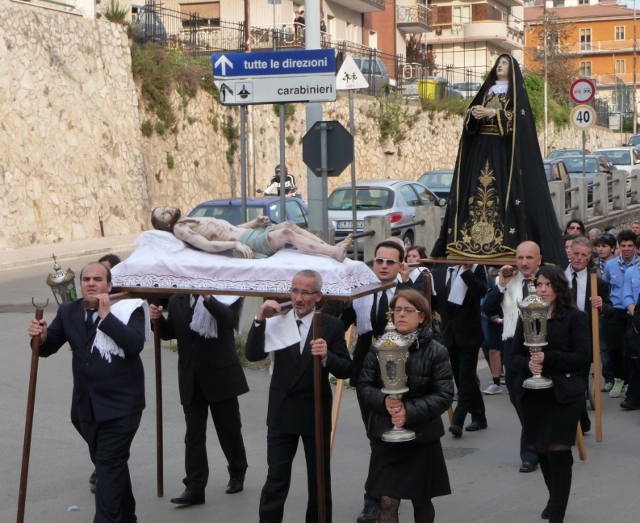 They soon emerge again, considerably later than the advertised 5pm start – with the cloths padding the shoulders of four of the men as they carry a bier bearing a statue of the body of the dead Jesus, the other four similarly bearing a wooden statue of the Madonna Addolorata – Our Lady of Sorrows. At a slow pace, the procession heads up the road, taking an hour or so to perform a loop around the old part of the town. The ladies of the town lead, dressed all in black. Behind them, a group of nuns preceed the statues, then the scouts and guides. Finally, the men head a larger congregation. All the while, the Miserere is sung, with the women taking one part, the men the other. Meanwhile, the main streets through the town are being closed to traffic. Dayglo is being worn everywhere, with the volunteer Protezione Civile forces of most surrounding towns busying themselves checking hydrants and moving fire tenders into position. 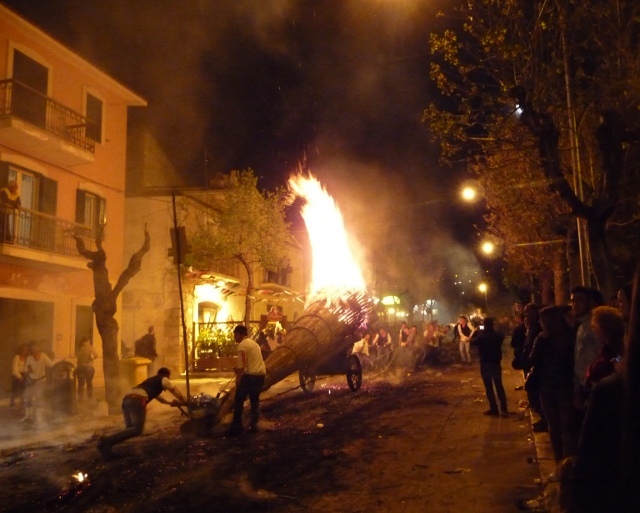 Along the Viale della Repubblica, climbing an incline from the church of the Vergine Addolorata, “fracchie” – large, wooden torches made of a single split tree-trunk – are parked in ever increasing numbers, as a JCB drags them out of the back streets and garages where they’ve been being built. 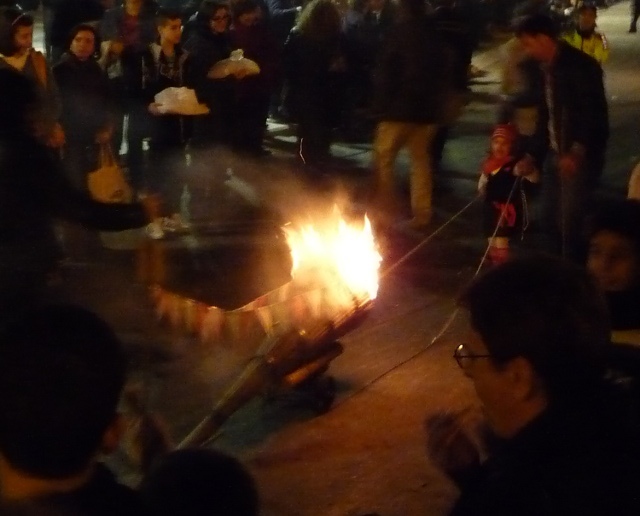 Eventually, once the light has started to fail and the evening passeggiata has become a thronging crowd lining the roadsides, smoke starts to rise as the first, smallest fracchie are lit. The first one to come through is barely larger than some of the models outside shops in the town, and is towed by a single tiny girl (with a bit of help and encouragement from her father). Haltingly, they file past. From our vantage point, standing on the lower steps of the roundabout, the gentle glow of the first few is quickly replaced by flame, then clearer views, as the larger fracchie start to appear. 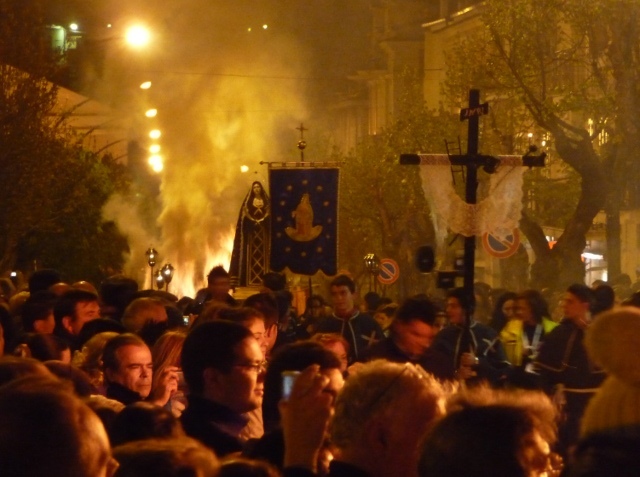 Within the hour, a gap in the flame gives the reason for the torches – lighting the route for the Madonna Addolorata, preceded and followed again by the strains of the Miserere. Behind her, a throng of local dignitaries in their tricolour sashes and a major celebrity – Albano, famous as a singer from the late ’60s through to today, just about visible under a Panama hat in the middle. We’ll gloss over his apparent preoccupation with his mobile phone call. It’s not over yet, though. There are still more fracchie to come. LOTS more. For the next three hours, the big torches are lit, pulled and steered by heaving, panting and sweating teams of up to twenty men. Waiting for the procession to start, we’d got into conversation with an older local couple, who explained some of the history to us. The fracchie used to go down the same narrow Corso Matteotti as the afternoon procession. 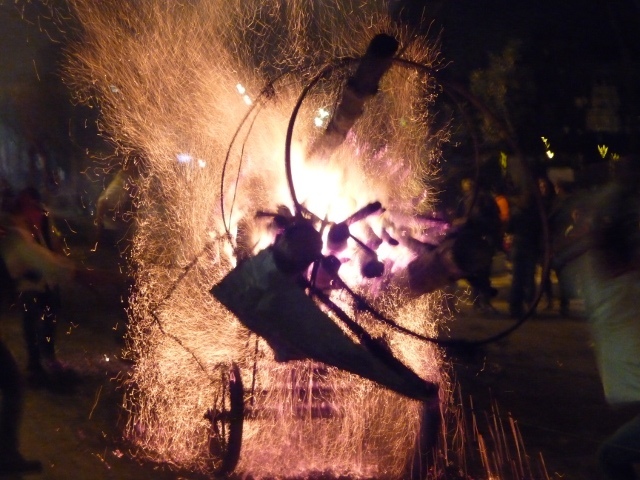 Originally hand-held torches, they’d grown to the stage they needed to be dragged on wheels. Then they’d continued to grow as rivalries and competitiveness crept in. Eventually, after a set of wheels collapsed under the weight one year, and as damage to the road surface and overhead wires grew ever worse, regulation crept in. Now, there’s a maximum to the size to be pulled along the less-enclosed route. 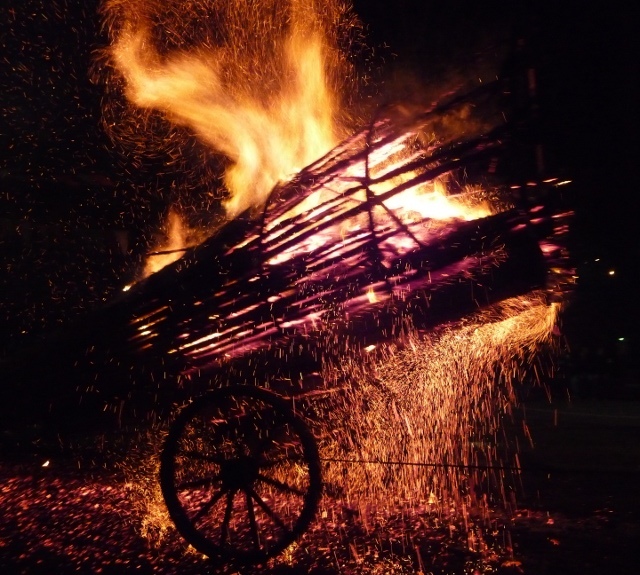 The largest torches must be about ten metres long, and at least a couple of metres in diameter. 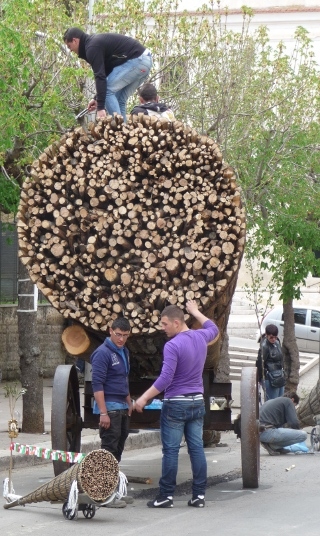 Made from a single solid tree-trunk, split at one end, with wedges of Oak and Chestnut driven in to flare them out, bound with iron rings and firmly attached to iron undercarriage, they apparently weigh up to ten tons. Lighting them is accomplished with the help of generous helpings of accelerant – two litre water bottles full of red diesel, larger bottles of used engine oil, and seemingly endless amounts of enthusiasm. One team seemed to be having difficulty getting theirs to catch properly, despite the generous amounts of diesel being slooshed at it. Eventually, the inevitable happened – the flame caught the bottle’s neck. Quickly dropped, it rolled around on the road surface in the middle of a small pool of fire, being kicked out of people’s way. When the torch was dragged up hill again, it got caught and squished underneath the trunk’s tail-skid, leaving a long line of flame behind. The next team were determined that they would have no such problems, with one lad standing on top of the torch as the fuel-soaked rags stuffed between the stakes were lit, pouring engine oil down the face of it all. 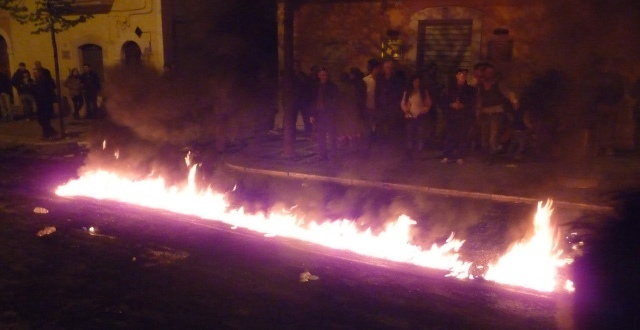 As the earlier, more restrained, torches had been taken down the road, teams from the local council had used metal rakes to clear the ashes and embers away from the road surface, leaving it clear for the next to come. Once the Madonna had passed, though, that was deemed unnecessary. 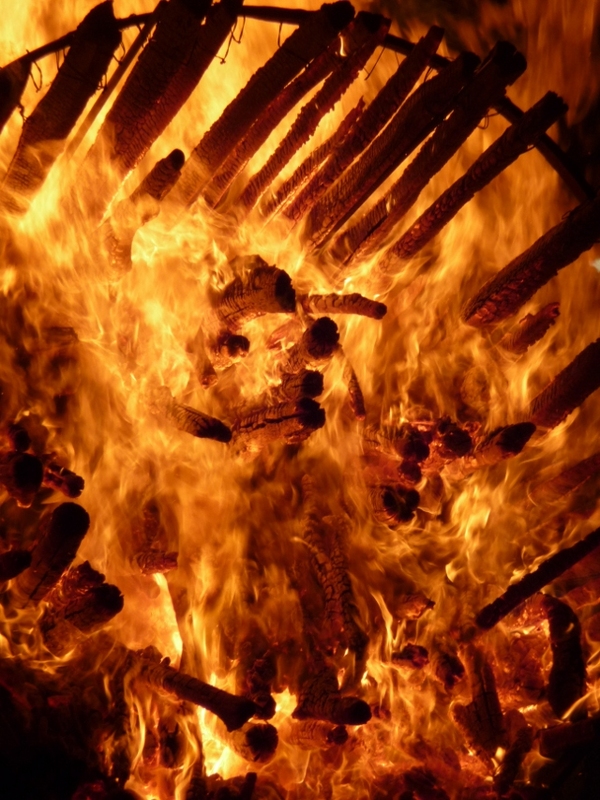 As the torches paused, and were thumped, shaken and prodded to keep them properly ablaze, the amount of burning wood built up. As the teams stumbled over and through precarious levels of debris, the volunteer firemen stepped in with high pressure hoses to disperse it and spray the road down. Periodically, an over-lively torch was damped down a bit, amidst friendly jeers, in a vain attempt to try to keep it under control. By the end of the town, a distance of no more than a few hundred metres, there was precious little of the torches left. The first couple of iron hoops hung forlornly, with the remains of a handful of stakes reminiscent of the skeleton of a crashed aeroplane. Another team of firefighters were ready with hoses to extinguish them, a huge pall of smoke rising as they succumbed, then were dragged off to join the stubs of those which had gone before. We left at midnight, with the last torch just lit and starting the journey. The impeccably behaved crowd were all but gone, the last few milling around cheerfully, but the enthusiasm of the teams was undimmed. Perhaps it was the knowledge that, this year, their efforts were immortalised in a commemorative postage stamp. Perhaps it was the knowledge that the tradition has been nominated for UNESCO world heritage status. Perhaps it was just – well, just because. This entry was posted in Art & Culture stuff, By Country - Italy, Uncategorized. Bookmark the permalink. 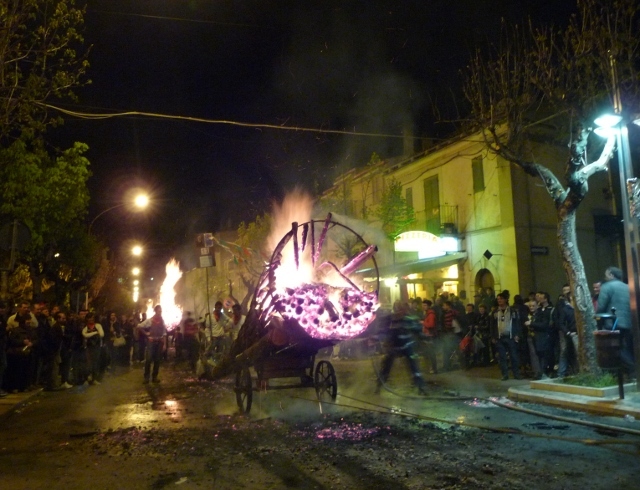 Very well documented of Good Friday in San Marco in Lamis-Italy. This year I came back to experience the event after some many years, being born in this town la nostalgia is always there. Thank You. I’m glad you enjoyed it – we certainly enjoyed the Fracchie procession. It was a night that we’ll remember for many years to come.